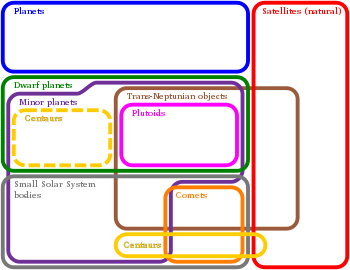 A trans-Neptunian object (TNO, an aa written transneptunian object) is ony minor planet in the Solar Seestem that orbits the Sun at a greater average distance (semi-major axis) nor Neptune, 30 astronomical units (AU). Twal minor planets[nb 1] wi a semi-major axis greater nor 150 AU an perihelion greater nor 30 AU are kent, which are cried extreme trans-Neptunian objects (ETNOs). ↑ 2003 SS422 is excludit frae the coont acause it haes an observation arc o anly 76 days an hence its semi-major axis isna securly kent. ↑ C. de la Fuente Marcos; R. de la Fuente Marcos (September 1, 2014). "Extreme trans-Neptunian objects and the Kozai mechanism: signalling the presence of trans-Plutonian planets". Monthly Notices of the Royal Astronomical Society. 443 (1): L59–L63. arXiv:1406.0715  . Bibcode:2014MNRAS.443L..59D. doi:10.1093/mnrasl/slu084. This page wis last eeditit on 28 Mairch 2017, at 20:46.